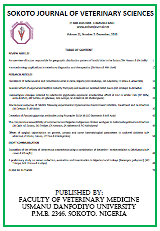 Sokoto Journal of Veterinary Sciences (SJVS) is an open access, peer reviewed journal published by the Faculty of Veterinary Medicine, Usmanu Danfodiyo University, Sokoto-Nigeria. The Journal was established in 1999 with the objective of promoting veterinary profession and to facilitate the cross fertilization of ideas in various areas of livestock production and health. With effect from 2018, SJVS will be published quarterly in March, June, September and December. Articles published include full research papers, reviews, case reports, short communications and editorials in all areas of Veterinary and Animal sciences, including livestock health and production, diseases of wild life and fish, preventive veterinary medicine and zoonoses among others. The journal is currrently indexed/abstracted by Agora, AJOL, CAB abstract [Agroforestry Abstracts, Agricultural Economics Database, Animal breeding database, Animal production database, Animal science database, Dairy science database, Environmental Science Database, Grasslands and Forage Abstracts, Helminthology abstract, Nutrition Abstracts and Reviews Series A:Human and Experimental, Nutrition Abstracts and Reviews Series B: Livestock Feeds and Feeding, Nutrition and Food Sciences Database, Parasitology database, Plant Breeding Abstracts, Poultry Abstracts, Protozoological Abstracts, Review of Medical and Veterinary Entomology, Review of Medical and Veterinary Mycology, Tropical disease bulletin, Veterinary Bulletin, VetMed Resources and Veterinary Science database], DOAJ, DRJI, Google scholar, Hinari, Index Copernicus, Index scholar, Index Veterinarius, International Scientific Indexing, JournalSeeker and Scopemed.